Are you a company looking for the right team to assist you with your large warehouse installation? Or maybe you find yourself at home searching for an electrician that you can trust to be there and help you in an emergency? 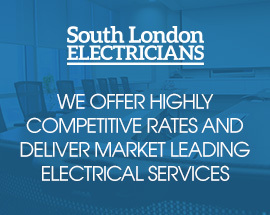 Whichever one you are, you will find the very best service with South London Electricians. Located in Croydon and covering the much wider area we are able to offer our expert services to those living Thornton Heath, Cheam and many others. Our services have been available for over 23 years, and during this time we have developed what we believe to be a truly affordable and professional service. Offering resolutions in key areas of electrical need to both residential and commercial customers we are proud to have developed an excellent reputation in the field. Perhaps this has something to do with the core values of the Company; not only delivering first class results but also with an eye on affordability for you; the customer. That is why, before any work commences we always offer a no-obligation quote on the work that is required, just to be sure that it is within your financial limitations. However just because we have an eye on competitive rates that doesn’t mean that we don’t provide great quality too, in fact we have received many positive comments from customers about the level of service and the end product that they have been left with! Our team of electricians have experience in all of the areas that we cover and understand that there are different needs for the various customers. As well as experience we also recognise current legislation and guidance on wiring regulations. With this in mind you can rest easy knowing that the work you will be left with is of the highest quality and fully compliant with all relevant guidelines. We truly believe that no job is too big or too small and we always approach every client with the same level of customer focus no matter what the size of the task. Call us on 07956 523316; 24 hours a day, 7 days a week and speak to one of our advisers. Let us show you exactly what we can achieve for you!